Alwar is located in the north-east of Rajasthan between 27°34′ & 28°4′ north Latitudes and 76°7′ & 77°13′ east Longitudes. 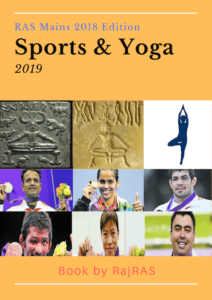 Alwar is bounded by Mahendragarh (Haryana) in north-west, Gurgaon(Haryana) in the north and north-east , by Bharatpur in the east, by Duasa in south and Jaipur in south-west & west direction. 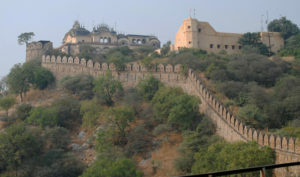 Alwar city is located at a distance of 165 kms from Jaipur the state’s capital city which is also the nearest airport. During ancient period around 1500 BC, Alwar was part of Matsya region of olden times whose capital was Viratnagar. Also known as Matasya Desh, this is said to be the Pandavas, the mighty heroes of the Mahabharata, spent the last years of their 13-year exile. Early medieval times, Alwar was ruled by Jadaun clan of Chandravanhi rajputs. In ealy 13th century Nahar Khan of the same Chandravanshi clan converted to Islam in thirteenth century during Firuz Shah Tughlak’s regime. Alawar Khan who was the descendent Nahar Khan, established the kingdom of Alawar in 1412 A.D.
During Mughal period, Khanzada Hasan Khan Mewati fought against invader Babar and later on Hasan Khan’s nephew Jamal Khan gave his two daughters to Humanyun and Bairam khan in marriage. In the 1550s, Khanzada Rajput king of Ulwar was overthrown by Akbar’s military campaign to encircle Mewar Kingdom. Later on 25th November 1775, Rao Pratap Singh raised his standard over the Alwar Fort and founded the modern kingdom of Alwar. Founded the princely state of Ulwar. He also devoted himself to the work of extension and consolidation of the territory of the State. Maharao Raja Bakhtawar Singh rendered valuable services to Lord Lake, during the latter’s campaign against Marathas, in the battle of Laswari, in the Alwar territory when the State troops assisted him in finally breaking the Marathas and Jat powers. As a result, in 1803, the First Treaty of Offensive and Defensive Alliance was forged between Alwar State and the East India Company. Thus, Alwar was the first princely State in India to enter into Treaty Relations with the East India Company. It was in the times of Jai Singh that name of state was changed from Ulwar to Alwar. Following the independence of India in 1947, Alwar acceded unto the dominion of India. On 18 March 1948, the state merged with three neighboring princely states (Bharatpur, Dholpur and Karauli) to form the Matsya Union. This union in turn merged unto the Union of India. 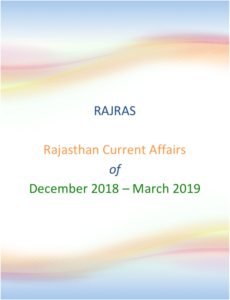 On 15 May 1949, it was united with certain other princely states and the territory of Ajmer to form the present-day Indian state of Rajasthan. The Matsya festival of Alwar held in November over two days is the foremost of all fairs and festivals of Rajasthan. It is celebrated to glorify the prosperity, traditional values and colourful customs of the region. It is celebrated at Bansur, on the Jaipur border in honour of Shitla Devi. This 14th century fort is best known for its turrets, ramparts and arched verandas. 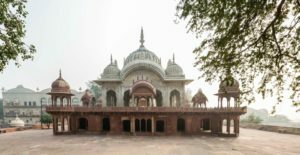 It was built by the Yaduvanshi Rajputs, who are said to be descendants of Lord Krishna. 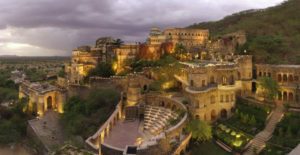 Today, the fort has been converted into a heritage hotel. The Bala Qila (meaning young fort) was built on the foundations of a 10th century mud fort and is a towering structure set atop a hill. Strong fortifications, graceful marble columns and delicate latticed balconies make up the fort. Bala Qila can be entered through six gates, namely Jai Pol, Suraj Pol, Laxman Pol, Chand Pol, Krishan Pol and Andheri Gate. Raja Bakhtawar Singh built the city palace in 1793 AD. The palace is an amazing mélange of the Rajputana and Islami styles of architecture. The highlight of this palace is graceful marble pavilions set on lotus flower bases in the central courtyard. The palace that once belonged to the Maharaja has been converted into the District Collectorate. Its grand halls and chambers now house government offices. Located fifty kilometres from Sariska Sanctuary is the splendid town of Bhangarh which was built in the 17th century by Raja Madho Singh. The most popular legend states that the town was cursed by an evil magician and was subsequently abandoned. 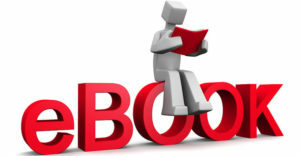 The evil effect of the curse is believed to be working even to this day. 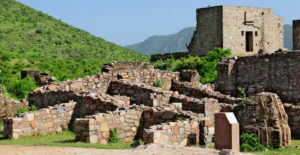 In fact, Bhangarh holds the distinction of being one of the most haunted places in India. 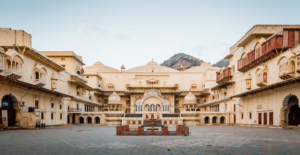 The Palace Museum is a must-visit for anyone with an interest in the opulent life and lifestyle led by the Maharajas of Alwar. Rare manuscripts, including one depicting Emperor Babur’s life, Ragamala paintings and miniatures and even historic swords that once belonged to Muhammad Ghori, Emperor Akbar and Aurangzeb can be found here. This cenotaph, built in the memory of Maharaja Bakhtawar Singh and his queen, Rani Moosi, reflects the Indo-Islamic style of architecture. The upper portion comprising columned pavilions and domed arches is made of marble while the lower section consists of pillars in red sandstone. The memorial is rated as one of the finest of its type. History says that Neemrana Fort was built by the Yaduvanshis, believed to be the descendants of Lord Krishna. Its story is rife with conquests and defeats and it has passed from the Rajputs to the Mughals and the Jats, before finally coming back to the Rajputs in 1775. Today, it is being run as a famous heritage hotel. This spectacular tomb, which is a combination of domes and minarets is an artistic marvel. Constructed from high quality sandstone, its massive dome can be seen from afar and is a blend of Hindu and Muslim architecture. It is dedicated to Fateh Jung who was a kind-hearted minister of the Mughal Emperor, Shah Jahan. About 60 kilometres from the Alwar-Delhi route lies this important centre of Jain pilgrimage. The exquisitely decorated ancient temple was built to commemorate the eighth Tirthankar, Shri Chandra Prabha Bhagwan. The son of King Mahasen and Queen Sulakshana, he ruled his kingdom for several years before receiving Diksha and being initiated. After serving mankind for several years, he meditated for a month and attained Nirvana. The Sariska-Alwar road leads to this enchanting site where pilgrims bathe in hot sulphur springs. Tinkling scattered temple bells and strolling langurs lend it a unique ambience. 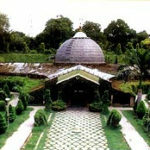 It is famous as the place where Mandav Rishi sought penance. The Fairy Queen is a national treasure and the oldest working locomotive engine in the world. The engine was built in 1855 and acquired by the Eastern Indian Railways from a British firm.The train that harnesses this engine is now used for tourism between Delhi & Alwar. Geography of Alwar comprises of rivers, mountains, plains and semi-arid areas. 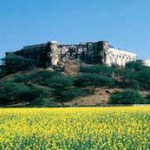 he beautiful ranges of the Aravali Hills surround the city, which act as a natural barrier for the city, protecting it from the harsh and dry winds during the summer season. The rocky ranges of the Aravallis break the undulating plateau into fragments. The city is adorned with expansive stretches of dense deciduous forests that are inhabited by rich flora and fauna..
Around Alwar region, five rivers used to flow but due to deforestation and mining activities the rivers dried up. Presently due to the special initiative of Tarun Bharat Sangh, rivers Arvari and Ruparel were revitalized again by using the traditional water harvesting methods and by constructing ‘Johads’ or small earthen check dams. Two of its stream rises near Bairath & Sewar hills in Jaipur. The river flows in north-east direction across Alwar to Najafgarh lake near Patodi in Haryana. Ruparail river rises in Thanagazi tehsil from Udaynath hills. It is also called as Lasavar river and varah river. The river flows in south-east direction to flow into Bharatpur. 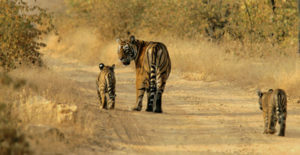 Sariska is a wildlife refuge that was declared a wildlife sanctuary in 1955. In 1978, it was included in Project Tiger and given the status of a tiger reserve. In 1979 it was upgraded to National Park. Further, 16th-century Kankwadi fort, built by Jai Singh II, is also located near the centre of the park. Sariska is famous for Bengal Tigers but other species such as such as the Indian leopard, striped hyena, Indian jackal, chital, sambhar, nilgai, chinkara, four-horned antelope, wild boar, hare, hanuman langur can also be found inside the park. Located 15 kilometres to the southwest of Alwar, this tranquil lake is nestled amidst forested hills and boasts of magnificent cenotaphs on its bank. In 1845, Maharaja Vinay Singh constructed a hunting chalet here for his Queen, Shila. Today it is a tourist bungalow. Garbhaji Falls is a popular destination for foreign and local tourists. The breathtaking sight of the water cascading off the rocks is the best feature of the place. Ideal for photographers and nature lovers, it is also popular with people who love to explore a city beyond its man-made structures. One has Maharaja Sheodan Singh to thank for this attractive garden that was conceptualised and constructed in 1868. A picturesque place, locally known as Simla (the Summer House) was added to this garden to provide respite from the blazing sun. The metallic minerals include copper(Pratapgarh, Kho-Dariba and Bhagoni), iron and manganese, while non metallic minerals include batytes, silica sand, quartz, yellow ochre, pyrophyllite, soapstone, limestone, granite and marble etc. According to 2011 census the population of Alwar district was 36,71,999. It is 3rd largest populated district after Jaipur & Jodhpur.